Provide comfort for the family of James Culbreth with a meaningful gesture of sympathy. 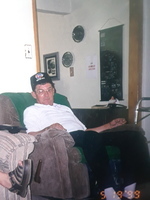 James Culbreth, age 82, a resident of Belen, passed away on Friday, March 15th, 2019. To send flowers in memory of James W Culbreth, please visit our Heartfelt Sympathies Store. Provide comfort for the family of James W Culbreth by sending flowers.